Recovery work is underway in parts of Vermont after flash flooding damaged many roadways and bridges. Contractors and road crews in several Vermont towns are scrambling to reopen roads washed out or badly damaged by rushing water. The recovery work is already underway in Bethel, which was hit hard by flash flooding Sunday night into Monday. “We had no idea it was going to be as extensive as it was,” said Greg Maggard, the town manager of Bethel. Maggard said he has tallied serious impacts to ten roads and four bridges, along with damage in other spots around town. 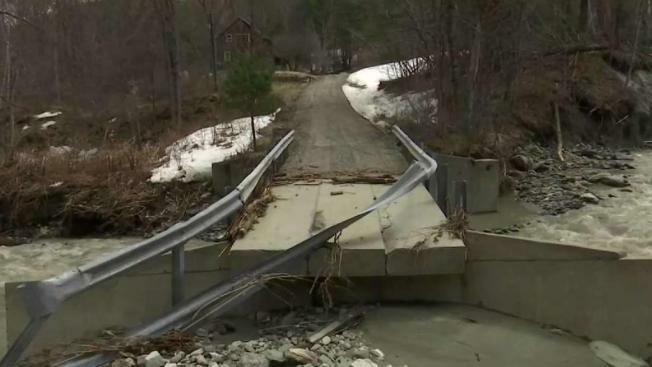 A combo of heavy rain and melting snow from a long Vermont winter created rushing torrents strong enough to devour sections of Camp Brook Road. Maggard said Bethel’s priority is reconnecting cut-off properties. Other seriously-affected communities include Pittsfield and Cavendish. Gov. Phil Scott, R-Vermont, is expected to tour Pittsfield and Bethel Wednesday, along with personnel from Vermont Emergency Management. As repair work continues in hard-hit places, in the Champlain Valley, all eyes are on rivers—including the Winooski River. Its waters are raging and flowing into Lake Champlain—and more water is on the way. “Unfortunately, there is,” National Weather Service meteorologist Scott Whittier said of a system expected to bring heavy rain later this week. Additionally, Whittier said there are still more than a hundred inches of snow atop Mount Mansfield, ready to melt. Whittier said that one-two punch could push Lake Champlain into its flood stage of 100 feet by early next week, when low-lying properties and roads near the shoreline start seeing impacts. Back in Bethel, Maggard said he is confident his community will recovery well from the flooding. Maggard said his team is keeping careful records of damage estimates and repair costs, which will help determine if the region hits certain thresholds making it eligible for federal disaster aid.